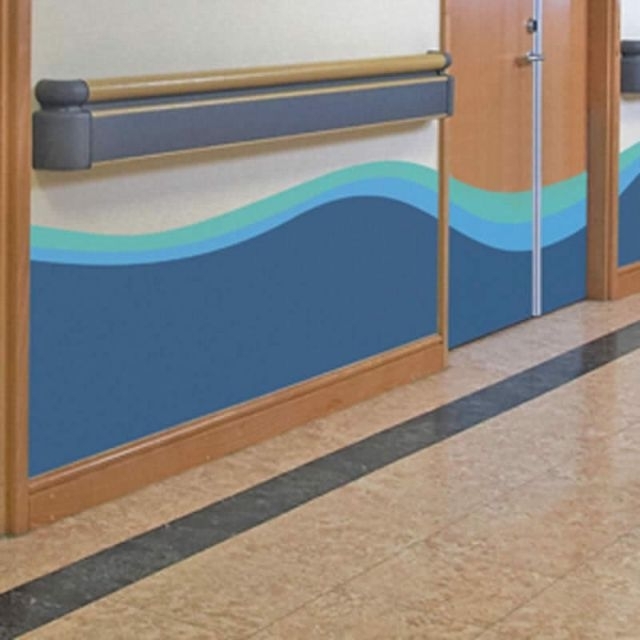 In addition to the made-to-order service of cutting and forming into bespoke designs and protection profiles, Antibacterial Impact Protection Sheet can be pre-ordered cut into shapes such as waves, patterns or murals with water jet cutting for more intricate shapes. Shaped patterns and wording to provide bespoke designs relevant to clients’ requirements, visually enhance surroundings whilst still protecting doors and walls. Class 'O' fire rated, tested to BS 476-6 and -7. Anti-bacterial properties inc Hygienilac® (textured option). Visually enhances surroundings with unique designs. Maintains a clean hygienic environment. The product information below is from the NBS Plus library of product clauses offered in NBS specification products. It has been created by NBS for Intastop Ltd. Each product clause is authored in NBS format and is intended for inclusion in project specifications. Please note that NBS product guidance is not a replacement for the manufacturer's literature and it is recommended that Intastop Ltd be consulted before specifying. As drawing - Insert drawing/ design reference number as appropriate.